Brookline Town Hall is located at 333 Washington Street, Brookline, MA 02445; phone: 617-730-2000. Fairsted (photo) was built ca. 1810. 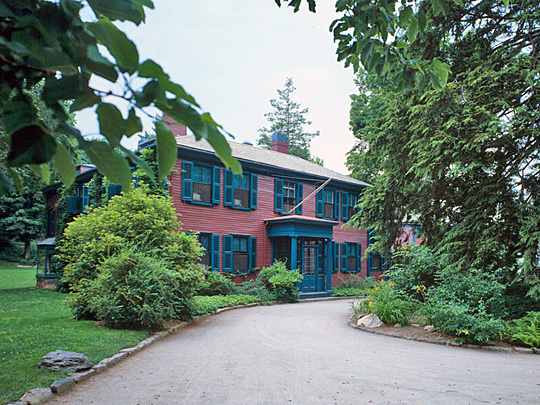 It was purchased by Frederick Law Olmsted in 1883. It was designated a National Historic Site by the National Park Service in 1980. In 1630, the Company of Massachusetts Bay, bringing the Charter of its Governor, John Winthrop, arrived in London. Shortly afterward the worthy citizens of old Boston found their Common overcrowded with cows, and the town fathers found it needful to seek a new place to the west for grazing. Governor Winthrop first mentions 'Muddy River Hamlet' in his writings in connection with the early allotments made for 'planting.' John Cotton, urbane, affable, and of easy fortune, as his well-fed embonpoint testified — the foremost divine of Boston — was granted the first tract of land. Following him, other distinguished citizens of Boston hastened to secure for themselves generous grants, until by 1639 the available acreage began to run decidedly short. After the first famous allotment of January 8, 1638, the grants were smaller, more numerous, and made to less well-know applicants. In the earliest days, agriculture was naturally the most important industry. Truck farms raising produce for sale in Boston, and fields, were under cultivation as early as 1662, and a clerk of market was appointed to represent Muddy River farmers at Old Faneuil Hall Market, Boston. Growth of the little village went forward, and in 1705 it was granted recognition as a separate town of Muddy River Hamlet (now euphemistically called Brookline), having been named for the estate of Judge Samuel Sewall, of witchcraft fame, who owned a large tract in Muddy River. During the American Revolution much property in Brookline owned by Boston Tories was confiscated. A Mr. Jackson sold his home and moved away when he was forced to provide quarters for Continental soldiers. The house of Henry Moulton, counselor for the British Government, was mobbed by a crowd of boys who broke the windows with stones. By the middle of the 19th century a larger town hall was built; the first railroad ran through the town; telegraph posts and wires were beginning to appear; the Coolidges had a store near the spot later to be known as Coolidge Corner. As time passed, many leading citizens of Boston were attracted to this flourishing suburb, so far removed in appearance as well as in name from the Old Muddy River Hamlet. Taxes were low. Brookline was near Boston and could be reached by train and trolley in a short time at a moderate fare. It was an ideal commuter's town. In 1870 Boston attempted to annex Brookline. Aroused, the citizens gathered in a town meeting and blocked the proposal. Five more times Boston attempted to pull out this coveted plum from the political pie, but each time met with failure, though at times the margin of votes was narrow. Brookline is today an 'island' almost entirely surrounded by Boston.